Everyone get that facebook notification asking you to like the PTL page on facebook because there's going to be news about PTL soon? What's everybody think? A new PTL album made by DB and TW? A greatest hits kind of thing? A PTL reunion tour? IHTFAF 20th anniversary is next year. That would be my guess. The asked people for their favorite Pedro songs earlier today, so my guess is it's a full band tour of Pedro songs...or a greatest hits thing but I'm not sure that's something Dave would do, tour seems more likely. Maybe a "greatest hits" but the songs are all re-recorded in new ways by current Bazan? Well done Bob! I'd assume 20yr Anniversary as well. My impression is that Bob was teasing us a bit about a "greatest hits album," a joke highlighting that PTL didn't have any. undertowmusic wrote: greatest hits album? 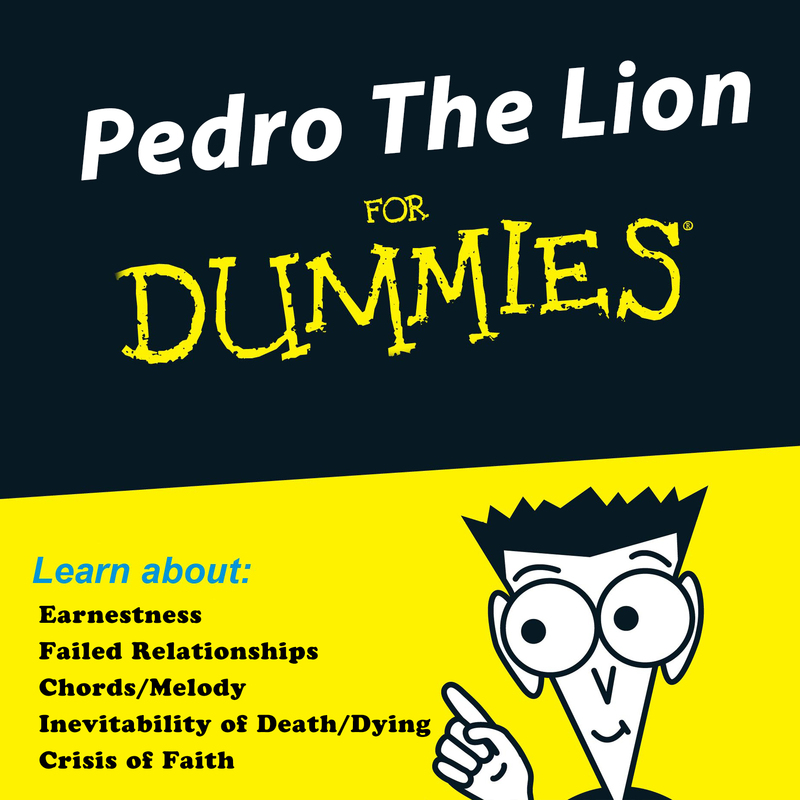 "Most Depressing Songs that were released by Pedro The Lion"
there is no greatest hits album being planned. we will have some proper Pedro The Lion news the first week of October. in other news... Jade Tree sold their entire label catalog to Epitaph. which is a bummer. not because Epitaph purchased the catalog. The folks at Epitaph have been nice to deal with so far. It's a bummer because Jade Tree never told us they were selling it until after it was done. They never gave us a chance to buy PTL catalog back even though they knew we wanted to (we asked before). the good news, Epitaph is getting the vinyl back in print (same remasters we used for the 2012 re-issues). looks like sometime in mid 2018. Wow, interesting. Thanks for filling us in on the Epitaph thing. Glad they've been good to deal with, but bummer that Jade Tree didn't give you the opportunity to Control the catalogue yourselves. Looking forward to the PTL news at the beginning of October. undertowmusic wrote: there is no greatest hits album being planned. we will have some proper Pedro The Lion news the first week of October. So I'll soon be able to combine two of my biggest high school/college loves: Pedro the Lion and West Coast Punk Rock...dreams do come true! Yeah, I had that thought, too. I was all about ordering stuff via mail from Fat Wreck Chords when I was in high school, and was all about all those NOFX releases on Epitaph. ragamuffin wrote: So I'll soon be able to combine two of my biggest high school/college loves: Pedro the Lion and West Coast Punk Rock...dreams do come true! [quote="sherpa141"]Yeah, I had that thought, too. I was all about ordering stuff via mail from Fat Wreck Chords when I was in high school, and was all about all those NOFX releases on Epitaph. Me too! High school was pre-internet for me so those Punk-O-Rama and Fat comps were how I found out about new bands, along with bugging the older kids that worked at local record stores. I'm a school teacher now and when I try to explain label loyalty to my students, they have no idea (no pun intended) what I'm talking about. I'd buy a cd without hearing it if it was on Fat or Epitaph or Lookout back in the day. Umm, but back to Pedro...I won't rule out rebuying all the Pedro albums just to have the Epitaph logo on the back. Hopefully they release the remastered versions on CD or cassette since I already have them on vinyl. Also, does anyone know if the version of "Fewer Moving Parts" on Bandcamp is the remastered version? I want it in FLAC/WAV and I'm pretty sure the download code that came with the record was only MP3s.